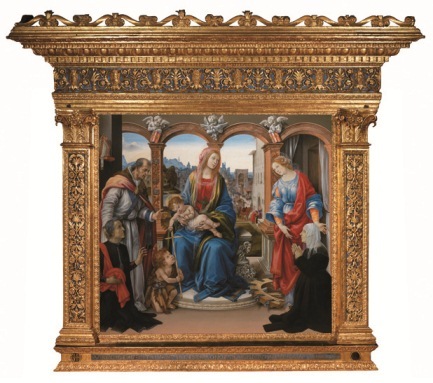 Next Sunday, February the 12th 2012, the altar-piece Nerli by Filippino Lippi will be welcomed home by Florentines. It is back to its original spot, the Santo Spirito Church. 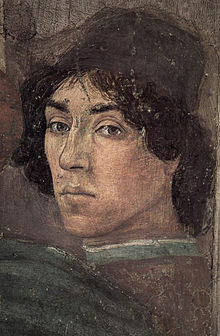 The painting, which has been there for five hundred years, was moved to the restoration workshops and after its rebirth it was sent to Rome, as part of the exhibition “Filippino Lippi e Sandro Botticell nella Firenze del Quattrocento” at the Scuderie del Quirinale. The restoration work has been great. Accurate and swift. The painting has been brought back to its original splendor and beauty, and new details reveal, now, the rich materials employed such as the stunning gold of the frame, the silver of the grottos and the lapislazuli of the Vergin’s dress. The yellowish light which seemed to hint at a sunset after the cleaning has revealed clouds before invisible and more defined countenances of the characters. The scene is very harmonious, in the front the Virgin with the Child and San Giovannino enclosed by St Martins of Tours and St Catherine of Alexandria. The sacred group is framed by the commissioners Tanai de’Nerli and his wife Nanna. At the back Florence with its San Frediano Gate and scenes from ordinary daily life among which a man saying goodbye to his family on a doorstep before a departure. A very Florentine architectural element, a loggia, separates the two worlds, the sacred and the profane. Is there a link between the two spheres? Since the painting records a historical event episode of Nerli’s life, his leaving for France for negotiating peace with Charles VIII, king of France, maybe the background reveals a moment of his familiar life, his hug to his daughter in front of his wife while a groom cares his horse. The art historians are at work on the issue. Florence is a very romantic town. Imagine strolling on Ponte Vecchio with the person you love, on a special day, St Valentine’s. A suggestion definitely more valuable than a large bunch of red roses. Why not profit from the holiday apartments in Florence offered by Tuscany Holiday Rent ?